At the end of every month, I write a recap of the month. I always wonder if readers wonder why I do this. Well, I’m a realist. In my perfect world, you wake up and can’t wait to see what is new on Cutting for Business and head immediately to check out the blog. In reality, I know that blog readers are busy. You have families, small businesses, and maybe even other jobs. I write the recaps so that if you’ve missed anything, you can go back and catch up. Instead of a blog recap today, I’m sharing my favorite posts of the year. They aren’t the posts that were most popular; or even the ones I made the most money from. They are just my favorites, and I’m sharing why. Tutorial: How to Create Semi Custom Designs Using Kits – This post teaches you how to create a design using a kit made by a designer. For those that aren’t confident enough to make their own cut files, it is a great beginner friendly way to make unique cut files. Two Ways to Use PNG files in Silhouette Studio – PNG files are everywhere on the internet for free. This tutorial teaches you to use them with your Silhouette. Where to Go to Start a Business in Your State – If you are going to be serious about selling products made with your Silhouette or Cricut, go through the process to become an actual business. Doing so helps add legitimacy to your company. Scroll Saw + Silhouette Cameo or Cricut Wood Shape Tutorial – What can I say, I love my scroll saw and want everyone to have one! Top 4 Overcrowded Silhouette Cameo and Cricut Business Niches – Before you spend a lot of time learning to make products, you should really know what a lot of people are already doing! How to Create an Effective ‘About Me/Us’ Page for Your Craft Business – Your About Me page says a lot about your company. I read a lot of About Me pages of fellow crafters and they are downright boring. Use yours to make a connection to your buyer. Remember, people buy from people they like. Affiliate Income in Your Silhouette or Cricut Business – Not a lot of Silhouette and Cricut small business owners are using affiliate programs as another stream of income. However, there’s a handful of Cutting for Business readers that are making a killing doing so! Vinyl on Cups, Tumblers, and Mugs – Designing Smarter – When you create well thought out designs, they will last longer on your cups. This post tells you what to do – and what to not do. Unique Places to Host a Popup Shop for Your Craft Business – Think outside the box! This post gives you ideas of places to sell. Easy, Free Small Business Marketing by Wishing Your Friends a Happy Birthday – This post is another ‘outside of the box’ idea, but it is working well for several Cutting for Business readers. Tutorial: Craft Perfect Heat Transfer Vinyl on Leather – This style of bracelet is one of my favorite to make; and I’m happy to share the tutorial with you. Design Tutorial: Working with Text in Silhouette Studio – I love, love to work with text based designs and I give you tips in this post. Free Fairy Tale Inspired SVG Cut Files – I had such a great time creating these cut files. Of course, I’m giving them to you free for commercial use. Real Silhouette and Cricut Business Owners Share their Advice – It was so fun to collaborate with so many readers to write this post. And, the advice they shared was great! 50+ Farmhouse Words & Sayings for Crafters – What can I say? I love the farmhouse trend – as do so many others. Tutorial: How to Make Cut Files with Dingbat Fonts – So many people overlook dingbat fonts. But, don’t! This tutorial teaches you how to use them to make cut files. 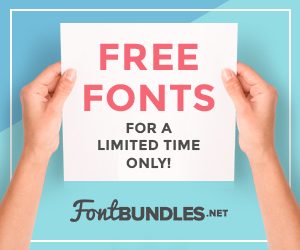 30 Free Commercial Use Dingbat Fonts for Crafters – This post goes hand in hand with the last. After you learn how to use them, download these. Craft Room Tour – I got a new craft room this year! Woohoo for a bigger space (with a locking door)! Tutorial: How to Make Photo Jewelry using Silhouette Studio & Sublimation – Photo jewelry has never been easier than with your Silhouette and your heat press! Free ‘The Craft Room is Calling and I Must Go’ SVG Cut File – I love the way this cut file turned out. And, it is so very true. Download it with free commercial use. Silhouette Cameo 3 vs. Cricut Maker – Which One is Best for You? – I get irritated online when I see this question posted and people with one machine or the other answer. If you don’t have both machines – don’t answer. If you are shopping for a machine, buy the one that suits your needs best. How to Estimate USPS Shipping in Your Craft Business – I see a lot of new sellers get sticker shock with the cost of shipping. Prevent it by estimating your shipping before you send packages. How to Create a Customer Loyalty Program for Craft Businesses – I’ve said it (oh, a few hundred times) before – cherish your repeat customers. In this post, I give you an easy to implement loyalty program. 30+ Commercial Use Curly, Swirly, Swishy Script Fonts – I love swirls and flourishes. If you do, too – get your fix with this list. The Big List of Places to Download Free Commercial Use SVG Cut Files – Free commercial use cut files can be hard to find. Don’t worry, I scoured the internet for websites that offer them – so you don’t have to! Thanks for a wonderful 2017 and allowing me into your craft rooms, offices, and small businesses. This is great, Christine! I’ve spent my whole morning reading through all of them. Thank you!